There’s no question who the alpha is in Neil Horman’s family. 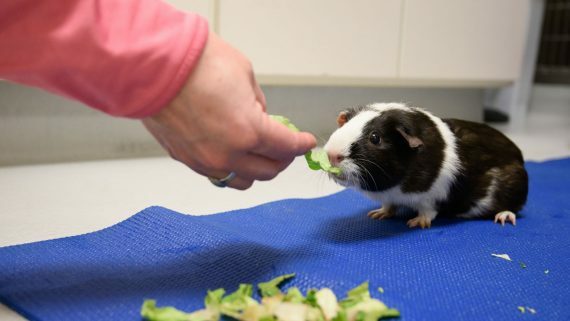 It’s Muffin, the family’s 5-year-old guinea pig who shares a pen with her adoptive sister, Bunny, and keeps her in line. Muffin also manages to let her humans know what she wants and where she wants it. When she reached a certain age, she decided that she wanted her food placed in an easier to reach location, so she simply stopped eating until the humans got the message. But when Muffin faced a recent health scare, it was the Horman family’s turn to take charge. Now, thanks to the NC State Veterinary Hospital and a grant from the Petco Foundation to help with treatment, Muffin is back to being the boss. Last spring, the Hormans’ daughter, Emily, first noticed something on Muffin’s cheek that looked like a pimple. It was a swelling that had ruptured; there was blood on the side of Muffin’s face. The family took Muffin to a local veterinarian in Cary that same day. A biopsy revealed that the spot was a carcinoma, a cancer that originates in the skin or organ tissue. Muffin was immediately referred to the NC State Veterinary Hospital. After two surgeries, Muffin’s cancer has not returned. The medical alternatives for Muffin that were outlined for the Hormans, chemotherapy, surgery and euthanasia, included some difficult choices. Surgery was the family’s preference, despite the cost. 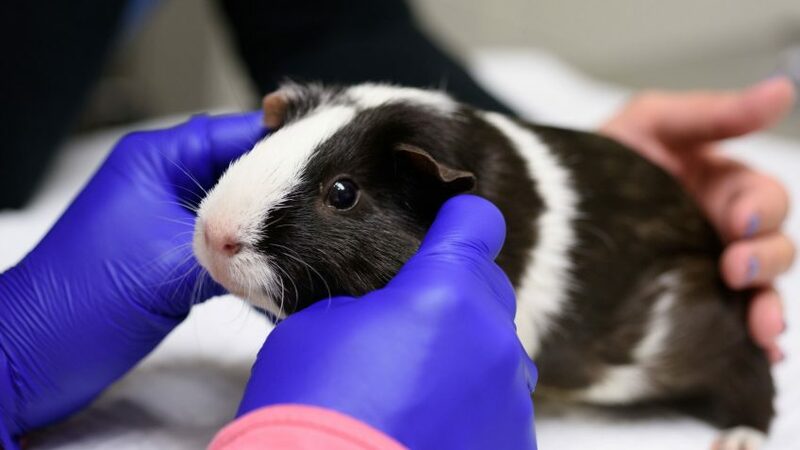 Small mammals and other so-called “exotic” pets, like birds and reptiles, are often not treated for cancer when families are faced with a large financial burden. This not only results in shortened life spans but deprives veterinary medicine with valuable opportunities to learn more about the most effective treatments for exotic animal cancers. 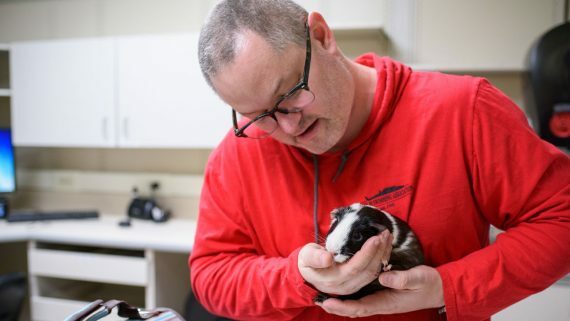 That is why the Petco Foundation has provided NC State with substantial grants to help defray the cost of treating companion animals with cancer. Horman says that the availability of the Petco Foundation grant funds made treating Muffin’s cancer a no-brainer. An initial surgery removed the surface growth. After a recurrence of swelling and bleeding, a second deeper surgery last summer removed the tumor at the margins and cancer has not returned. “The vet school is definitely NC State’s crown jewel,” Horman says. “The care they give, the love, the responsiveness to our questions … they called, they emailed, the detail they provided, it really was amazing. The things they do are incredible. We couldn’t be more pleased. Our monthly newsletter highlighting the bright minds, innovative research and state-of-the-art medicine at NC State's College of Veterinary Medicine.